WASHINGTON (AP) - A Trump administration freeze on new Environmental Protection Agency contracts and grant awards raised fears that states and other recipients could lose essential funding for drinking water protection, hazardous waste oversight and a host of other programs - while a communications blackout left them dangling in uncertainty. The agency also took a potential first step Tuesday toward potentially killing environmental rules completed as President Barack Obama's term wound down. At least 30 were targeted in the Federal Register for delayed implementation, including updated pollution rulings for several states, renewable fuel standards and limits on the amount of formaldehyde that can leach from wood products. President Donald Trump signed a directive shortly after his inauguration ordering a "freeze pending review" on all federal rules issued by agencies but not yet in effect. But what the administration described Tuesday as a temporary suspension of new business activities at the department, including issuing work assignments to EPA contractors, sowed widespread confusion about its reach. EPA contracts with outside vendors for a wide array of services, from engineering and research science to janitorial supplies. Emails to staff banning press releases, blog updates or posts to the agency's social media accounts contributed to the information vacuum. "Is President Trump the only one allowed to tweet in government right now?" Liz Purchia, who was EPA press secretary for the Obama administration, said in an email to The Associated Press. "I just keep thinking how thankful I am there isn't an emergency disaster EPA needs to respond to right now. ... It's one thing to get your ducks in a row, but to put a gag order on public servants and all agency activities, not only prevents them from doing their jobs. It puts our country at risk." Similar orders barring external communications have been issued at agencies within the departments of Transportation, Agriculture and Interior. "Vladimir Putin must be proud," said Ken Cook, president of the Environmental Working Group, an advocacy organization. "The EPA, like all federal agencies, is funded by taxpayer dollars, and Americans have the right to know what's being done to protect or harm public health and the environment." 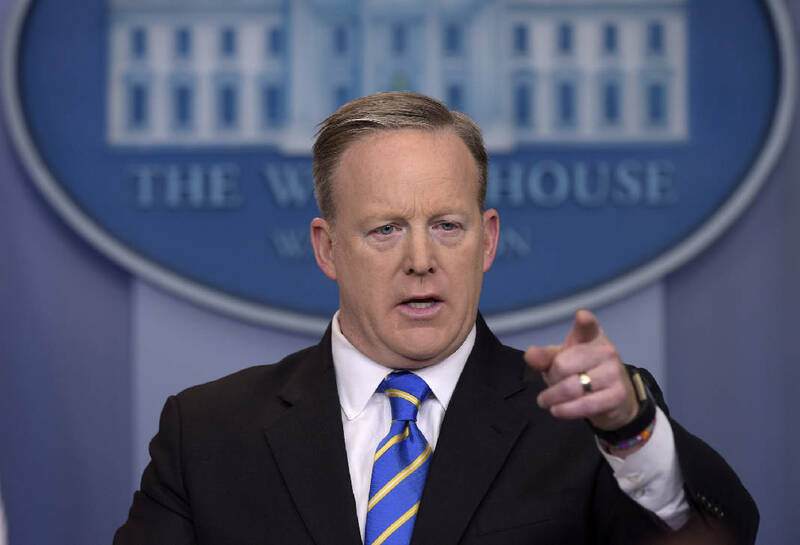 White House spokesman Sean Spicer said Tuesday he had no specific information on the blackout but added, "I don't think it's any surprise that when there's an administration turnover, that we're going to review the policies." Doug Ericksen, communications director for Trump's transition team at EPA, said the communications clampdown probably would be lifted by the end of the week. "We're just trying to get a handle on everything and make sure what goes out reflects the priorities of the new administration," Ericksen said. The freeze on EPA contracts and grants won't apply to pollution cleanup efforts or infrastructure construction activities, he said. The agency said later the delay was for a review of transactions in the works and it should be finished by Friday. Still, confusion reigned in states led by Democrats and Republicans alike that depend on EPA funding. "We are unsure of the immediate or long-term impact" to programs in Montana involving wastewater treatment, underground storage tanks, air quality and more, said Kristi Ponozzo of the state Department of Environmental Quality. Utah's DEQ is "seeking additional information so we can understand the impact of this action on our ability to administer critical programs," said Alan Matheson, executive director. Members of Michigan's congressional delegation raised concern that the freeze could jeopardize aid to Flint, a city still dealing with lead contamination of its water supply. Senate Democratic leader Chuck Schumer of New York urged the Trump administration to drop the media blackout and contracting holdup. "This decision could have damaging implications? for communities across New York state and the country, from delaying testing for lead in schools to restricting efforts to keep drinking water clean to holding up much-needed funding to revitalize toxic brownfield sites," Schumer said. The executive director for the advocacy group Public Employees for Environmental Responsibility, Jeff Ruch, said the Trump orders go beyond what has occurred in prior presidential transitions. Ruch noted that key posts at EPA have not yet been filled with Republican appointees, including Trump's nominee for EPA administrator, Scott Pruitt. That means new senior personnel are not in place to make key decisions. Environmentalists said the orders were causing low morale among EPA staff already beleaguered by repeated criticism from Trump and Pruitt. Staff at the Agriculture Department's Agricultural Research Service also received orders not to issue any news releases, photos, fact sheets and social media posts. After an email of the order leaked to the media, the agency said it would rescind the memo. "Gag orders that freeze communications with the public and government officials go against basic notions of government transparency and accountability," said Michael Macleod-Ball of the American Civil Liberties Union.